Nash Dhaliwal shows off some of the lush blueberries available. Harvest time’s a family affair for the Dhaliwals at Cox Lake farm, off Franklin River Road. Nash and Seva Dhaliwal are in the thick of blueberry season at the farm they operate at Cox Lake, off Franklin River Road. This year the 33-year-old blueberry bushes—all four acres of them—have received the right combination of spring rain and summer heat, and they are flourishing. “I saw some that looked like grapes,” Seva said during a recent visit to the farm on a sweltering weekday. 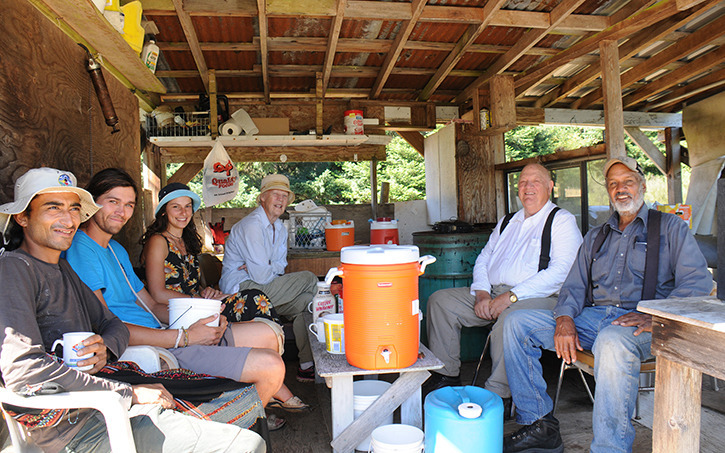 The Dhaliwals have worked the farm since 1993, when Seva signed up as a picker. Nash, who was a logger for 30 years, joined in the operation after discovering the man who owned it was a fellow colleague at Sproat Lake Division, Mark Murray. Murray retired from the farm in 2005, but the Dhaliwals still lease the farmland from him. “Myself, I have run it 11 years now. It’s a retirement project,” says Nash. Nash and Seva’s three children—daughters Kiran and Ruby, and son Sunny —no longer live in Port Alberni, but they come back in rotating shifts to work at the farm. The Dhaliwals also have a core of pickers who return every year. Margaret Cameron and Bob Thomas have been picking for 10 years, ever since Margaret brought her grandkids to do some picking one day. “It’s such a nice place, with the lake and the fresh air,” Cameron said. Picker Sam Ashton, from Ireland, and Danielle Affleck, from New Zealand, have both returned for the blueberry season to earn some money before travelling. “B.C. is a very beautiful place,” said Ashton. This year Ashton’s friend Mauro Gonzales, visiting from Colombia and Belgium, also joined the picking crew. The blueberry harvest season is short—about seven weeks in late July and early August. Once the harvest is finished Nash will cut the grass, and when the rain starts he leaves the bushes alone until Christmas, when he will prune them back to allow for new growth the following spring. The Dhaliwals supply blueberries to Naesgaard’s Farm Market, to Quality Foods and their own booth at the Spirit Square Farmer’s Market at Harbour Quay every Saturday during the season. Part of the farm is you-pick, and part of it they hire pickers for supplying to their customers. Many of their you-pick customers are repeat, says Kiran, and quite a few people hear about them through word of mouth—even as far as the Lower Mainland. “We had a chef here, driving to Tofino; he’s from Vancouver and he heard about our berries,” she said. Cox Lake Blueberry Farm is located on Franklin River Road, two kilometres past the intersection with Ship Creek Road. The blueberry farm is open seven days a week from 9 a.m. to 7 p.m., rain or shine. When the signs come down, the season is over. For orders or information, please call Nash Dhaliwal at 250-720-9245.